Guocoland (Malaysia) Bhd, the property arm of the Hong Leong group, will roll out the remaining properties, worth RM1.7 billion, at its Emerald Rawang township in Selangor over the next six to seven years. The 400ha Emerald Rawang, divided into Emerald East and Emerald West, is a 50:50 joint venture (JV) between Guocoland and Hong Bee Land Sdn Bhd (HBL). HBL is part of the diversified Hong Bee group, controlled by the low-profile Gan family. Since the project started in 2001, some RM400 million of properties, comprising 1,300 double-storey link, semi-detached and detached houses, have been built and sold. Guocoland executive director Chan Chee Meng said the joint-venture company has been busy developing the infrastructure, a nine-hole golf course, and clearing hills in the past 12 months. “We are investing RM100 million to do that and works are nearing completion. We will speed up development of the properties after this, in line with demand,” Chan said at the launch of the Emerald sales gallery in Rawang, Selangor, yesterday. The project offers double-storey link, semi-detached, detached and cluster homes, totalling 3,700 units. From now until December, the joint-venture company will launch two phases each in Emerald East and Emerald West, with houses worth more than RM100 million, Chan said. There will also be a Chinese school and shoplots, which will be ready by 2011 or 2012. HBL is also forming a joint venture with the Jusco group to set up a departmental store and hypermarket at Emerald Rawang, which will open at around the same time. “We are optimistic of positive sales. The economy is recovering, interest rates are low and there is high demand for gated and guarded housing. Our project has key attributes such as freehold status, modern designs and the golf course. “Our houses are also affordable. A semi-detached house at the township is worth around RM500,000, while the same product in Klang, Subang or Puchong could cost around RM1 million,” Chan said. He added that depending on demand, the joint-venture company may buy pockets of land nearby to develop the township further. RAWANG: GuocoLand (M) Bhd is lining up property launches worth RM1.7bil in gross development value (GDV) at its RM2.1bil Kota Emerald township development project in Rawang over the next seven to eight years, a senior company official said. “The remaining projects (in Kota Emerald) will last until either 2016 or 2017 and about 70% of the whole project is high-end property development,” executive director Chan Chee Meng told a media briefing here yesterday. Guocoland has sold RM400mil worth of properties since it launched the Kota Emerald project in 2001, with sales expected to reach RM500mil sales by year-end, he said. Four more phases of the project are set to be launched there this year, comprising semi-detached houses, double-storey houses and bungalows, according to Chan. The Kota Emerald development is a joint-venture project between GuocoLand and Hong Bee Land Sdn Bhd, with GuocoLand as project manager. The project, on 1,000 acres freehold land, comprises Emerald East and Emerald West, with a bridge linking the two areas. Among the facilities and amenities are a 9-hole golf course, to be operational by the fourth quarter, and a Chinese school that can accommodate 2,000 students. On the property market outlook, Chan said the market had been slow in the first six months, but has started to improve due to competitive interest rates and a supportive lending environment. “The property market is getting competitive as more and more launches are expected to hit the market due to the better environment,” he said. GuocoLand posted a net loss of RM3.37mil in the third quarter ended March 31 with revenue of RM17.7mil due to lower contributions from property development and its hotel segment. Its fourth quarter results will be out this month. 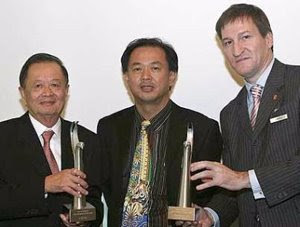 The company was expected to break even in the financial year ended June 30, 2010, supported by more property launches and a better market sentiment, Chan said. GuocoLand Malaysia is a member of the Hong Leong group. PETALING JAYA: The slew of property launches and speedy take-up rates lately are signs that the local (property) sector is on a quick rebound from the global economic downturn. In its latest report, HwangDBS Vickers Research said the local high-end property sector had been on an uptrend, with developers raking in quick profits from project launches. Among them were DNP Bhd’s Verticas condominiums in Bukit Ceylon, Kuala Lumpur, which saw 60% of the 50 units soft launched being taken up. En bloc buyers also snapped up 93% of non-bumiputra units launched (last month) at IJM Land Bhd’s Light Linear project in Penang. “We see demand for high-end units returning, which could re-rate the sector,” said HwangDBS. 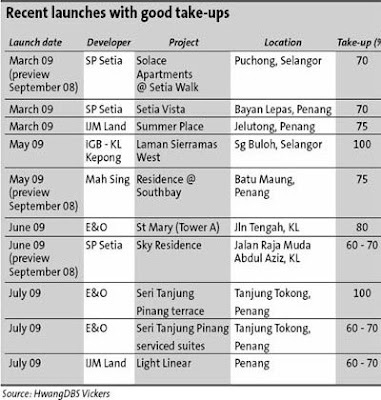 It also highlighted Eastern & Oriental Bhd’s St Mary serviced apartments in Kuala Lumpur (launched in June, 80% take-up in five days) and SP Setia Bhd’s Sky Residences condominiums in KL (previewed in September 2008, with an average 70% take-up so far). “Developers are more confident now to resume launches, which should lead to faster earnings recovery. Selling prices may soon be raised and incentives gradually pulled back, resulting in margin expansion for developers,” HwangDBS said. An analyst from a local bank-backed brokerage said the take-up rates were not surprising, given the developers’ good reputation. “These developers aren’t your fly-by-night type of developers. They have very good reputation and solid track record. The average investor or house-buyer is more likely to park his money with a well-known developer, knowing that his money would be safe,” he said. Another analyst said the property sector was making a comeback in the region. In the last few months, Hong Kong, Singapore and China had seen strong surges in property demand, she said. “There’s so much liquidity with nowhere to go. This is one of the safest ways to fight inflation. Putting your money in the bank basically means being eaten up alive by inflation. “Malaysian property is generally still very affordable. If you don’t buy one now, it will be even more difficult to afford it next time. The 2% interest you get from banks is nothing,” she noted. HwangDBS also highlighted the Malaysia Property Inc, a joint public-private sector initiative aimed to attract foreign investments worth RM20bil in the domestic real estate sector over the next 10 years. “The recent liberalisation measures (abolishment of local equity ownership requirement for mergers and acquisitions and Foreign Investment Committee approvals) should help boost both foreign and local demand for Malaysian properties. “Previous policy changes (waiver of real property gains tax and monthly EPF withdrawals) introduced just before the financial crisis have yet to be fully felt and could be strong catalysts during a recovery,” it said. Malaysia's property market is recovering, albeit slowly as home buyers are still cautious, and hopes are that developers will continue to offer incentives, says Khong & Jaafar Sdn Bhd managing director Elvin Fernandez . While the property market did suffer in the most parts of 2008, Fernandez said there was no major collapse in housing demand for the first half of 2009, thanks to developers’ initiatives. “We believe property transactions will start to move upwards given time,” said Fernandez, who is also deputy president of the Institution of Surveyors Malaysia (ISM). Fernandez said a major boost to the property sector will be to move Malaysia from a middle-income country to a higher level. To do that, the average household income has to match property prices and rental. “If all our policies bear fruits and the average household income doubles, property prices would also double,” he said. In addition, the supply of houses in the affordable or luxury categories should be related to the demand and supply in the housing market or otherwise, Fernandez said, bubbles would form and when they burst, there would be dire consequences for households. Meanwhile, this year’s National Real Estate Convention (NREC), to be held at Kuala Lumpur Convention Centre on August 11 and 12, will tackle issues such as possible structural changes in the way hotel owners and operators redefine their traditional model and the likely retooling of the real estate investment trust industry, in the wake of its own credit crisis. “We will examine the possible change that would occur with the 2012 full adoption of the International Financial Reporting Standards,” said Fer-nandez. The NREC is organised by the Association of Valuers and Property Consultants in Private Practice Malaysia and ISM. PROPERTY developer KLCC Property Holdings Bhd (KLCCP) posted a 4 per cent rise in first-quarter net profit to RM96.8 million, thanks to lower operating and finance costs. Revenue for the three months ended June 30 2009 stood at RM217.1 million, up 1.4 per cent from RM214 million in the same period last year. KLCCP attributed the increase in revenue to increased rental of its office buildings, particularly Menara ExxonMobil and Dayabumi in Kuala Lumpur, and its retail mall as well as increased revenue from its car park operation. KLCCP expects the current slow economic activity to continue to impact demand for the group’s hotel and retail services for its full year ending March 31 2010. However, the company said its measures previously implemented to contain costs and improve efficiency were beginning to show results. “The directors anticipate that overall group profitability for the current financial year will be in line with expectations,” it said in a statement to Bursa Malaysia yesterday. Last week, the company paid its shareholders a final dividend of 5.5 sen per share, which amounted to RM51.4 million. JOHOR BARU: IJM Land Bhd is banking on the strategic location of its latest property development project in Nusa Duta near here as the main selling point. Managing director Datuk Soam Heng Chhon said another added attraction was its location within the development of Nusajaya regional city in Iskandar Malaysia. “This is a niche development as it only consists of 1,000 units of medium-high to high-end residential properties on a 58ha site,” he told StarBiz at the launch of the project on Saturday. Phase one of the project is made up of 191 units of double-storey link, clustered and semi-detached houses with prices ranging from RM381,600 to RM757,200 per unit. Soam said the gated and guarded project, with a gross development value of RM400mil, would keep the company busy for the next four to five years. Nusajaya, spanning 9,600ha, is the main key driver of Iskandar Malaysia, the country’s first economic growth corridor launched on Nov 4, 2006. Nusajaya comprises seven signature developments – Kota Iskandar (the Johor State New Administrative Centre), Southern Industrial and Logistics Clusters, Puteri Harbour Waterfront Development, EduCity, Medical City, International Destination Resort and Residential Developments. Soam said the project was also different from other existing and on-going projects within a 5km radius from Nusa Duta as it did not have commercial properties within its plot. “We are quite fortunate as our project is well surrounded with existing and upcoming conveniences and facilities developed by other developers,” he said. These include Bukit Indah AEON shopping mall, banks, schools, fast food outlets, a police station and Giant and Tesco hypermarkets which will open by the year-end and early 2010 respectively. He said the on-going RM1.3bil new coastal highway linking Nusajaya and the Johor Baru city centre, which passed through the project, would also boost accessibility to Nusa Duta. Soam said apart from first time buyers and upgraders, the company was also targeting Malaysian professionals working in Singapore and Singaporeans looking for landed properties here as the project was a short distance from the Second Link crossing. “We are also looking at more land in Johor, especially within Iskandar Malaysia as it offers long-term economic prospects in the property segment,” he said. Presently, IJM has 4.04ha in Permas Jaya and 101.17ha in Mount Austin, both within Iskandar Malaysia, and 477.52ha in Sebana Cove in Kota Tinggi district in the eastern part of Johor. PEMBINAAN SPK Sdn Bhd, a unit of SPK-Sentosa Bhd, has entered into a Arab Emirates Dirham 950 million (AED100 = RM98.15) deal with Aldar Properties PJSC to build 730 units of villas in Al Falah, Abu Dhabi. Al Falah is a master planned community for UAE nationals as part of the Plan Abu Dhabi 2030 directive, which was launched early this year at the Cityscape Abu Dhabi exhibition. The project will provide 5,000 homes for UAE families as part of the Abu Dhabi goverment’s housing initiative. Apart from Pembinaan SPK, a spokesman said contracts have also been inked with Al Jaber Building LLC Abu Dhabi and El Seif Engineering Contracting Abu Dhabi for the construction of the 5,000 villas in Al Falah. “However, Aldar Properties would not want to disclose the details of the contract at this stage. It is anticipated that the project will be completed by the third quarter of 2012,” the spokesman told Business Times. Meanwhile, SPK-Sentosa said its subsidiary, Pembinaan SPK had sealed a contract on July 15 with Aldar Properties for the construction and completion of 730 units villas in Al Falah. Aldar Properties, Abu Dhabi’s leading property company, was listed on the Abu Dhabi Securities market in 2004. Genting Bhd, Asia’s biggest publicly-traded casino operator, may open its S$6.6 billion (about RM16 billion) resort in Singapore before the end of 2009 and earn more than earlier estimated for the first year of operations, CIMB Investment Bank Bhd said. The “quick pace” of construction could lead to a pre-2010 opening instead of early next year, CIMB said in a report today after a recent visit to the site in Singapore. Genting may announce the resort’s opening date next month, it said. The casino resort in Singapore is expected to generate S$690 million in earnings before interest, tax, depreciation and amortization in the first year of operations, more than twice CIMB’s previous estimate, CIMB said. CIMB today raised its target price on Genting to RM9.40 from RM7.90. Shares of the company, based in Kuala Lumpur, gained 1.9 per cent to RM6.42 at 12:05pm, set to become the third-best performer on the Malaysian benchmark stock index today. Genting’s Singapore project is one of two casino resorts the government has allowed to be built in the city-state as part of its goal to lure 17 million visitors and triple annual tourism revenue to S$30 billion by 2015. Genting Singapore Plc, partly owned by Malaysia’s Genting, said on June 25 the resort in Singapore is on track to open in early 2010. Las Vegas Sands Corp, controlled by billionaire Sheldon Adelson, said on July 8 it will open its Singapore casino resort on schedule in January or February next year. Justin Leong, Genting’s head of strategic investments and corporate affairs, didn’t reply to an e-mail or answer his mobile phone. GEORGE TOWN: Etika Cekap Sdn Bhd, the owner of G Hotel at Gurney Drive, is investing RM100mil in another five-star hotel to be developed at Gurney Drive. Etika Cekap and G Hotel director Phuah Choon Meng said the new hotel, tentatively called Baby G Hotel, would have 200 rooms. “Located next to the G Hotel, the 22-storey building will have an iconic, environmentally friendly, and sustainable design theme,” he told a press conference on the achievements of G Hotel and Gurney Plaza shopping mall yesterday. Also present was Penang tourism development and culture head Danny Law, and G Hotel general manager Marco Battistotti. Phuah said research conducted by the company showed that there was room for another hotel in Gurney Drive. “Since G Hotel started operations in 2007, it has managed to maintain over 75% occupancy rate per year, without snatching customers from the other hotels in the area. “In 2008, G Hotel achieved an occupancy rate of 82%, and so far to June, it has already attained an occupancy rate of 79%. “This shows that a well-designed hotel with the appropriate facilities can carve out a niche market for itself in Gurney Drive,” he said. Last year, the other hotels situated in Gurney Drive, namely Evergreen Laurel Hotel and Gurney Resort Hotel and Residences, enjoyed over 80% occupancy rate.